The Women and Leadership Archives (WLA) is excited to welcome History Fair teachers and students! No appointment is required to come to the WLA and the archives is open Monday, Wednesday through Friday from 9am-4pm and Tuesday from 11am-7pm. Saturday appointments are available upon request, with advance notice. WLA staff are happy to work with both students and teachers on topic ideas and use of primary sources from the archives. When visiting the WLA, students may feel free to talk with staff about what records pertain to a potential subject and how to access finding aids. WLA staff are well-versed in working with primary sources and eager to help. Teachers may schedule a visit to the archives, utilizing the large reading room, or staff will bring the archives to the classroom. 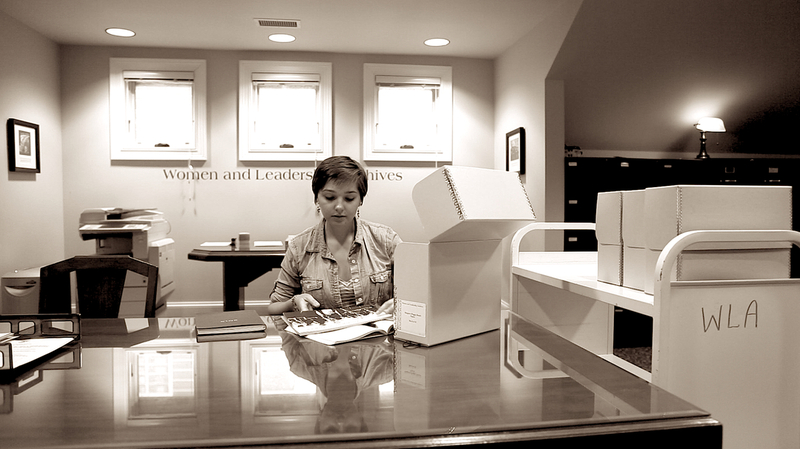 The WLA offers archival lab experiences for students to work with collections directly, customizing archives-related assignments for most academic disciplines. Class visits are an ideal opportunity to jump start class History Fair projects. Teachers may feel free to contact WLA Director Nancy Freeman to discuss potential topics and archival resources or arrange a class visit. Sometimes archival records are a bit "hidden" and specific pertinent collections are not readily visible through finding aids or other online resources. Nancy may be reached at nfreeman1@luc.edu or 773-508-8432. For hours, location, access, and other information, please visit the WLA Access & Hours page.